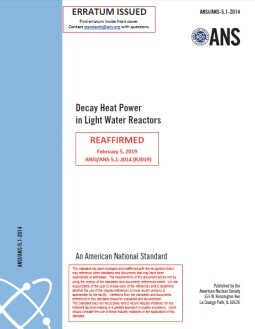 ANS 5.1-2014 (R2019) sets forth values for the decay heat power from fission products and actinides following shutdown of light water reactors (LWRs) using nuclear fuel initially containing 235U and 238U. The decay heat pwer from fission products is presented in tables and equivalent analytical representations. Contributions from the decay of 239U and 239Np and the contributions from all other actinides are represented separately. Methods are described that account for the reactor operating history, for the effect of neutron capture in fission products, and for assessing the uncertainty in the resultant decay heat power. The standard applies to decay times of up to 1010 after shutdown. This standard provides bases for determining the decay heat power and its uncertainty following shutdown of LWRs. The information in this standard can be used in the design, performance evaluation, and assessment of the safety of LWRs. The methods prescribed in this standard enable the calculation of fission product decay heat power with accuracies comparable to those of summation codes but without the need for complex calculations. The fission product decay heat power values in this standard have the advantage of being developed directly from experimental measurements for time periods <105 after fission. Therefore, this standard can be used as the basis for comparison with results of alternate methods for determining fission product decay heat power.